Jeremy Corbyn’s spectacular success in the British election should have worried Malcolm Turnbull. The Tories were humiliated for their agenda of cuts, in the face of socialist Jeremy Corbyn’s promise to tax the rich to fund services. Turnbull is a Tory who stands for the same war on workers with cuts to penalty rates, attacking union rights and workers’ conditions in the construction industry and cutting corporate tax. His budget has done nothing to help recover his standing. If an election was held this month, Labor would win by around 20 seats. So his government is ramping up racism and division in an effort to consolidate support. Peter Dutton is always on hand to spread lies and smears about refugees. Most recent was his dishonest labelling as “fake refugees” those who are yet to submit asylum applications. Following the terror attacks in the UK, and the siege in Melbourne Turnbull also dialled up his rhetoric. He spoke of “a growing threat from Islamist terrorism” and described it as “a disease… lashing out to destroy and undermine our way of life”. Along with the Islamophobia, he is pushing yet another round of new police powers. When Turnbull came to office, many in the Muslim community welcomed him, thinking he would break with Tony Abbott’s pointed attacks on the community. He even hosted an iftar dinner at Kirribilli House during Ramadan with prominent Muslim leaders. Now Turnbull sings from Tony Abbott’s song sheet. This year, there will be no repeat event. The Fair Work Commission has announced that the cuts to penalty rates will begin to be phased in, with penalties cut by 5 per cent from 1 July, and cuts of 10 and 15 per cent a year following that. An active union campaign could stop bosses implementing these cuts and finish Turnbull off. A modest campaign by Professionals Australia, representing pharmacists, has forced the Chemist Warehouse chain to maintain penalty rates, but only for existing employees. The ACTU has launched a video to pressure Members of Parliament. Turnbull is already under pressure because of the penalty rate cuts. In Victoria, Trades Hall is rolling out yet another marginal seats campaign—targeting independent MP Cathy McGowan. Hers is one of a number of target seats in Victoria where they are already organising street stalls and electorate-based actions. Unions are buying up advertising, and union members are being mobilised to petition to call on her to oppose the cut to penalty rates. A serious industrial campaign could kill off the cuts to penalty rates. Unions NSW is showing how it could be done. A combined unions delegates’ meeting has been called for 28 July. Other states should follow their lead. 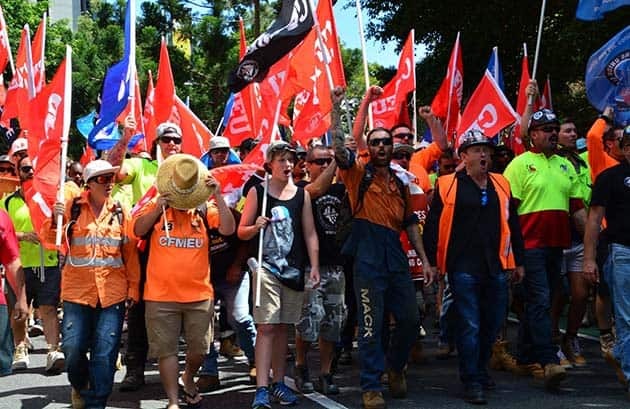 Delegates and activists are spending in the next few weeks getting resolutions from workplaces and union branches to support an August stopwork rally against Turnbull’s war on workers. The 20 June CFMEU construction union stopwork rally against the Australian Building and Construction Commission (ABCC) and the Construction Code will be the next chance to take the fight to Turnbull and the construction bosses. The ACTU secretary, Sally McManus, made headlines when she said unjust laws have to be broken. The ABCC and the code are certainly unjust. The CFMEU’s strikes show how to fight. It’s not enough to simply campaign for Labor to win the next federal election, due in two years’ time. Bill Shorten hopes to tap into the same disgust with cuts and neo-liberalism that drove Jeremy Corbyn’s campaign in Britain. In the aftermath of the election result he declared, “Australians also want to see policy which looks after most people, not just the top end of town.” But Shorten is a long way from Corbyn, and Labor has nothing like Corbyn’s radical platform. In 2007 Labor came to power under Kevin Rudd promising to tear up WorkChoices. But the bulk of the anti-union laws, including restrictions on the right to strike, remained in place. In its last year in office, to “balance the budget”, like Turnbull it cut $2.3 billion from universities and cut single parents’ payments. Labor is still committed to supporting the Liberals’ offshore detention and anti-refugee policies. Shorten’s “Australia First” slogan has been used to scapegoat temporary foreign workers for unemployment. In 2005, stopwork rallies launched the Your Rights at Work campaign and took the fight against Howard into the workplaces and the streets. To fight for real change we need more socialists in more workplaces and movements to build the union struggles and the anti-racist movements for refugees and against Islamophobia.